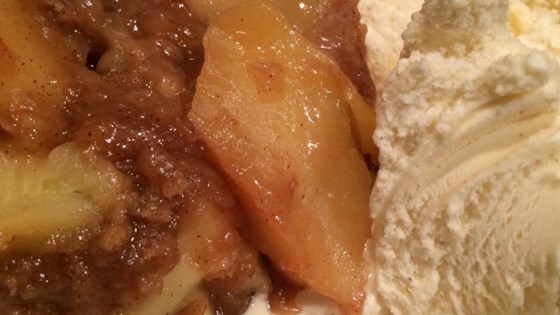 "An easy way to make a wonderful comfort food using those abundant fall apples! Serve with vanilla ice cream." Mix flour, brown sugar, 1/2 cup of white sugar, 1/2 teaspoon cinnamon, nutmeg, and salt together in a bowl. Combine butter with the flour mixture using fingers or a fork until coarse crumbs form. Stir in walnuts and set aside. Whisk together 1/3 cup sugar, cornstarch, ginger, and 1/2 teaspoon cinnamon. Place the apples in a slow cooker, stir in the cornstarch mixture; toss with lemon juice. Sprinkle the walnut crumb topping on top. Cover and cook on High for 2 hours or Low for 4 hours, until apples are tender. Partially uncover the slow cooker to allow the topping to harden, about 1 hour. Apples slowly cook with a cinnamony sweet mixture topped with walnut crumble. SUPER easy and SUPER yummy! I added 1 cup of oats to the crumb mixture before mixing it all together. Serve with vanilla ice cream and be prepared to make serious YUMMY NOISES!!! !